William Escott Collins was Rector of Eversholt church from 1901 to 1938. We have his personal photo album here! His career is documented in Crockford’s clerical Directory, courtesy of Ancestry.com. and here is the same thing from Crockford’s in 1932, very slightly less unintelligible. In the 1901 census, he’s listed as living in the Old Rectory in Hills End. He was born in Towcester in about 1865, and is single, but shares the house with a housekeeper and a parlourmaid. [Ancestry login required, sorry]. The housekeeper was Elenor[sic] Stephens, a widow aged 51, born in Newport Pagnell. The maid was 17-year-old Emily M Brookes, born in Swanbourne. In the 1911 census, he’s listed as living at the 13-room new Rectory in Church End. He married Judith Broom Mortimer in 1910 in Bristol, the record of which has his name illegible. He was 45 and she 31 when they wed. Mary Jane Ashford, 53, is the cook, and Nellie Hyde, 19, from Milton Bryan, is the parlourmaid. Collins, rev. William Escott, born at Towcester, Northants, 15 Feb., 1865; 2s. 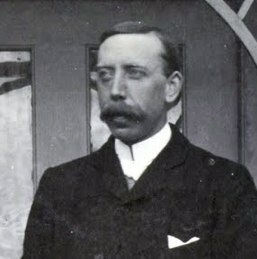 Robert Codrington, cler. Non-Collegiate, matric. 13 Oct., 84, aged 19 (from K. Edward school, Birmingham, and K. Henry VIII. school, Coventry) ; migrated to LINCOLN, B.A. 87 ; curate of Castor, Northants, 91. There is a brass memorial to Collins in the church. William died in Blandford, Dorset, in 1953, aged 89 or 90. He happened to die within a stone’s throw of me [EJW] being born. Collins the reverend William Escott of the Old Vicarage Stourpaine Dorsetshire clerk died 11 November 1953 Administration Winchester 7 January to Judith Broom Collins widow. It’s possible that William’s relatively small estate was good tax planning rather than penury. Estate taxes were very high in 1953.